Ayoze Perez is a man in form and Friday night took his goals for the season up to 8 with 7 of them coming in the Premier League. He is two goals behind Salomon Rondon who hit the crossbar again at Leicester and has 10 goals with 9 goals in the Premier League. 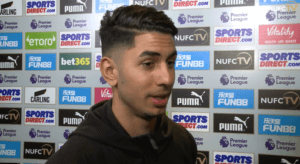 Last season Ayoze was Newcastle’s top goalscorer with 10 goals, and 8 of those were in the Premier League. So Perez is close to beating his goals of last season – with four matches to play. The Leicester result was massive for Newcastle United – we’re almost safe now. We have four games left to play, and all are winnable. 12 points from those games – yes, we know it’s unlikely – but it would take us up to 50 points for the season. We’d take that in a New York second. This Sunday evening, why not take time out and enjoy Schar V Leicester highlights. Includes his run which made many wonder when Newcastle signed messi and added a foot and half to his height. I guess when it comes down to it, no matter how much Benitez plans or wants to stay for next season it ultimately hinges on some other individual. I would think that Ed isn’t too bothered about multiples on the blog as it probably gives it more hits. Wouldn’t it be really ironic if the only game of the final four that we win was the Liverpool one. No matter how bad your day is just thank God you aren’t one of those Chelsea fans that traveled to Prague, racially abused Salah, were denied entry to their Europa League game then came back to England in time to watch Salah score that ‘bomber’ against their club from 30 yards. I meant JAF not JFA. Oops. I get mine for a local lad, just give him my stick and away you go, the lads at work use a forum which is a bit cheaper but you have to download the stuff yourself. Isn’t that what you do, sell dodgy subscription on a fire stick? Yes it was just a joke. To many people are looking for reds under the bed. Any fool could see I don’t have jibs interlect. See how I did that. What’s the best blog to go on to read comments from that lot down the road in relation to their nine goal thriller Vs Coventry. The ones I never mention by name. The mag likes to write about sunlan. It’s better on a stick so I can take it to different rooms. I was at a mates this afternoon and he’s got this thing called showbox, its pretty much a free Now TV, Netflix and Amazon TV all rolled in to one for nowt. Gawd knows what damage it’s doing to your phone mind!!! We will beat Liverpool 3-2 in one of the matches of the season and deny them the title. My mate couldn’t remember how to get it on, have you got a link pls? Funny how the Toon winning makes me a happy chap. Mackems lost makes the weekend so much better. No, it’s definitely not on playstore, it’s dodgy as foot. If you Google it there’s loads of different ones but can’t seem to find the right one, some will just download the title page then fill your phone full of ads. Why haven’t Northumberland got a decent cricket team? If you’ve got a fire stick you should try Morpheus for it. Bit like showbox. Only downside is some of the films are cams and lie about it but once it’s out as a hd rip it’ll be on there. It’s an APK so you’d have to download from an external downloader (not play store) there’s fireDL or downloader, once you’ve downloaded one of those (turn off trusted sources first) search for Morpheus apk and that’s it. Google for step by step guides.